One common trend in software development in the past couple of years seems to be to streamline products and remove options in the process. We see this in most tech products this day, be it browsers or operating systems. Windows 10 is a good example as it is more restrictive than previous versions of Windows when it comes to user choice and options. Personalization options are for instance limited when you compare them to previous versions of the operating system. You may notice for instance that you cannot change the white color of the title bar in Windows 10 which means that every window you open when you are running the operating system has a white title bar. While you can still access the personalization options with a right-click on the desktop and the selection of personalize, you will notice that it lacks core options that were part of previous versions of Windows. If you don't want your title bar color to be white, for instance because it is too bright in the morning or late at night, then you need to hack the system to change that color as there is no option to make that change in the settings. If you search for solutions on the Internet you will find many that suggest adding themes to the system or replacing system files. While that works, there is a simpler option that does not require as much effort but offers the same result. All you need to do is to download Winaero Tweaker from the Winaero website and use it to enable custom Windows 10 title bar colors (for those interested, we have reviewed the program previously). The program is a tweaking software for Windows 10 that you can use to change various system settings, and one of those tweaks unlocks the color selection for Windows 10's title bar. Download and extract the program files to your Windows 10 system. Run the program afterwards, and select Colored Title Bars under Appearance in its interface. Click on "enable colored title bars" to lift the white color restriction. You can use the personalize menu then to change the title bar, or have the system set it automatically based on the selected desktop background. The program ships with an option to undo the change at any time should the need arise. This can be the case for instance if Microsoft implements native options to change the title bar's color scheme with an update. For now though, it is the easiest option by far. Now You: Did you notice other missing features in Windows 10? 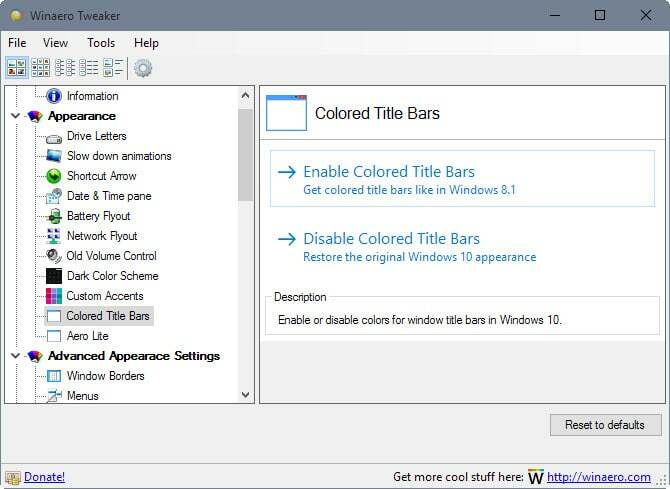 Find out how to change the title bar color of Windows 10 that the operating system uses for nearly any program window to another color. I have yet to find a workaround. all the e-mails. In windows 10, you have to highlight every one, then click on Delete. 2) The weather that appears in the Mail app is in Fahrenheit with no instructions on how to change to Celsius. a method to convert would be nice. You can switch to Celsius in the Settings. It is a bit hidden though. Open the Weather application and click on the three links in the top left corner. Select Settings at the bottom, and there you find the switch. I did that countless times and the weather settings don’t show anything to change from F. to C.
I am referring to the Weather that appears in the Calendar App and not the Weather App itself. In my first post, I mentioned Windows Mail App whereas I should have said the Calendar App. USA does use the metric system, however, it’s the common folks that don’t actually use it. (If you want to argue, http://www.joeydevilla.com/2008/08/13/countries-that-dont-use-the-metric-system/ is a great place to do it; I’m not actually here to argue). Even in countries that converted still have people using imperial systems in common talk. Not saying it’s right or proper not to include it for everyone, as I do like the metric system for everything but temperature (sorry but I like complaining that number is too high and feels extremely hot :-P and 36 isn’t a high number). I do use the metric system for temperature control on my computer tho. As to your actual problem, I don’t have a weather in my Mail app. I do have one in Cortana, which to change that you need to hit the 3 dots on the right-hand size and change the units. Same with the Weather app that came pre-installed. Was this an addon feature to add weather to your Mail app? One things you could try is make sure the Format setting is setup to Metric. The US uses the Metric system in the same way the rest of the world uses the Imperial system. Not really much point pretending the US is Metric, or that the engineers represent the country because they use it. I’m in the medical field. We use the metric for basically all calculations. It’s used more than you think but like I said, the common folk, don’t use it. There’s also a program called AeroTuner for Windows 7 that lets you turn off Aero Glass (the strips on the Taskbar and Titlebars) as well as some other stuff. It does not let you remove the shadow over the Start Menu and Notification Area though. Dunno how to do that. Meh, easy but not really effective if you want to use a darker color. The title bar font stays black unless I missed an option? Anybody else noticed that Windows 7 suddenly stutters and runs slower now? Especially when Microsoft inserted GWXDetector.exe and CompatTelRunner.exe to get you to fork over your private info with the “free” Windows 10? It’s like Microshaft wants to force you into an update. Not all windows are colored when you make this change. Edge and system windows don’t change. There is and option to set Windows update to notify for download and install instead of automatic. I didn’t try that to see if it works or not. I have not tried this program yet but would if someone can advise if there is any method to change the color of a program window as I prefer to have non white if possible and of course in all previous o/s over the past 20 years that was possible. I was able to change the title bar and border color from info obtained from newsletters as the white title bar was not good particularly when trying to drag the window to another location on the monitor. So if the program mentioned here does give an option to change the window color please advise as this is important to many folks that I and other admins communicate with in PC Tech in Paltalk. In the Personalization panel there are colored title bar themes. Much to difficult. I wait for the next build, wich comes in probably october. The only problem with this is if you use a darker color e.g. black, the text on the inactive tabs is difficult to see. The + on the new tab you can’t see at all. So I use a less darker black. In my case the title bars have colors except only when I open my Microsoft Edge browser of Windows 10. When I open the Chrome browser and some programs installed in my computer, there are colored title bars. So I want my Edge browser to get color in the title bar. “The accent color set for the Windows in the background will not reflect on the Edge browser. Edge browser comes with two default color settings, Dark and Light.” — from MS. Just the way they set things up for Edge. Don’t know if you want to change from Dark to Light or either way but if you do that can be done also. Open Edge browser and click on the More actions icon i.e.“…” located on the top right corner of the window. Select Settings and select either Dark or Light theme from the drop down bar under Choose a Theme option. HTH — done from a simple search via go ducky or any personal choice of a search engine. The nice part about the internet is while it is impossible to remember everything and pointless too, almost any info required is available with a quick use of a search engine.